Here we see the banjo neck’s dowel stick hole. Be very sure of your measurements before you drill this hole. It may be helpful to look back at the Dowel Stick post. The dowel stick hole can be drilled either before or after the neck has had its radius cut. It is typically drilled using a jig with the Shop Smith or the drill press, and a 3/4″ forstner bit. 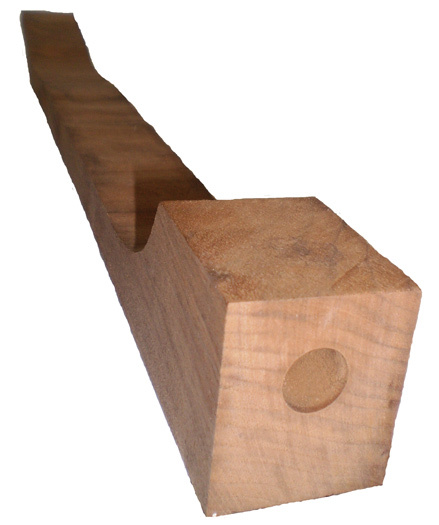 The jig holds the neck so that the dowel stick hole comes in at the same angle that the neck meets the rim, about 3 degrees. It is important to keep the hole straight in line with the center line of the banjo. A crooked hole makes for a crooked dowel stick. It is also important that this hole be drilled at the correct angle. At this stage I like to cut the heel of the neck to the correct angle, but leave it flat on the edge that will meet the rim. That way I can use a square to see that the forstner bit is drilling at the correct angle. When the neck is in the jig the forstner bit should come in at 90 degrees to the mating side of the heel. Try to drill the hole in one go, as multiple attempts could mis-shape the hole, resulting in a loose-fitting stick. Make the hole at least 1.5″ or a little deeper, but be careful not to drill completely through the other side of the neck heel. Enter your email address to subscribe to this blog and receive notifications of new posts by email. Your email address will not be shared. Subscribe with confidence! You will automatically be entered for a chance to win BanjoCraft Giveaways!